↑ 1.0 1.1 1.2 1.3 1.4 1.5 "Curtis Axel". Online World of Wrestling. Archived from the original on 2010-08-21. สืบค้นเมื่อ 2010-08-04. ↑ "Featured Content on Myspace". Myspace. สืบค้นเมื่อ July 17, 2015. ↑ 3.0 3.1 3.2 3.3 3.4 3.5 "WLW Profile". World League Wrestling. Archived from the original on January 1, 2008. สืบค้นเมื่อ September 21, 2008. 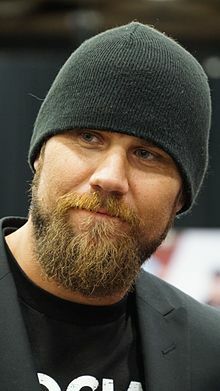 ↑ 4.0 4.1 4.2 4.3 4.4 "Curtis Axel bio". WWE. สืบค้นเมื่อ March 23, 2016. ↑ "WLW Profile: Ted DiBiase Jr". harleyrace.com. Archived from the original on October 5, 2007. สืบค้นเมื่อ October 7, 2007. ↑ Varsallone, Jim (2008-11-26). "Wrestling tradition continues with confident Smith". Miami Herald. Archived from the original on 2009-02-14. สืบค้นเมื่อ 2009-02-24. ↑ 7.0 7.1 "Florida Championship Wrestling (2009) – February 26, 2009 – Florida Championship Wrestling – TV Taping (airing 3/15)". Online World of Wrestling. 2009-02-26. ↑ "FCW Florida Heavyweight Title history". Wrestling-Titles.com. สืบค้นเมื่อ 2009-06-22. ↑ Caldwell, James (2010-06-01). "WWE News: NXT Results – Season Two announced, Pro & Rookie pairings revealed". Pro Wrestling Torch. สืบค้นเมื่อ 2010-06-01. ↑ Hillhouse, Dave (2010-10-04). "Hell in a Cell: Betrayal, fan interference, and flying shoes". Slam! Sports. Canadian Online Explorer. สืบค้นเมื่อ 2010-10-04. ↑ Plummer, Dale (2011-02-28). "RAW: Triple H talks Wrestlemania; The Miz loses an ally". Slam! Sports. Canadian Online Explorer. สืบค้นเมื่อ 2011-03-02. ↑ "History of the WWE Tag Team Championship: David Otunga & Michael McGillicutty". WWE. May 23, 2011. สืบค้นเมื่อ May 24, 2011. ↑ Plummer, Dale (May 23, 2011). "RAW: Cena gets nothing but the R-Truth". Slam! Sports. Canadian Online Explorer. สืบค้นเมื่อ May 24, 2011. ↑ Parks, Greg (May 21, 2015). "PARKS'S WWE SMACKDOWN REPORT 5/21". PWtorch.com. สืบค้นเมื่อ May 25, 2015. Axel came out to Hulk Hogan’s theme. Both were dressed up as the men they were imitating. ↑ "The Ascension def. 'The Mega Powers'". WWE. สืบค้นเมื่อ 17 July 2015. ↑ "Show results - 7/24 WWE in Bakersfield, Calif.: Cena vs. Owens Street Fight main event, Axel & Sandow drop Meta Powers routine, Cesaro, more". Pro Wrestling Torch. 25 July 2015. สืบค้นเมื่อ 25 July 2015. ↑ "The Social Outcasts take over the backstage area". WWE.com. 4 January 2016. ↑ "WWE RAW Results – 7/25/16 (Live from Pittsburgh, fallout from Battleground, new era of RAW begins)". WrestleView. สืบค้นเมื่อ 26 July 2016. ↑ "7/25 WWE Raw Results – CALDWELL'S Complete Live Report". PWTorch.com. สืบค้นเมื่อ 26 July 2016. ↑ Brendan, Marrow (June 19, 2017). "WWE 'Monday Night Raw' Match Results & Spoilers June 19th". Heavy. สืบค้นเมื่อ June 20, 2017. ↑ 29.0 29.1 "FCW Florida Tag Team Championship history". ↑ "Achievement Awards: Feud of the Year". Pro Wrestling Illustrated. January 10, 2011. สืบค้นเมื่อ January 15, 2011. ↑ "Achievement Awards: Most Hated". Pro Wrestling Illustrated. January 17, 2011. สืบค้นเมื่อ January 22, 2011. ↑ "Rookie of the Year". Pro Wrestling Illustrated. 30 (3): 62–63. 2009. ↑ "Curtis Axel's first Intercontinental Championship reign". Archived from the original on June 22, 2013. ↑ "David Otunga and Michael McGillicutty's first Tag Team Championship reign". WWE. May 23, 2011. Archived from the original on May 23, 2012. สืบค้นเมื่อ May 24, 2011. หน้านี้แก้ไขล่าสุดเมื่อวันที่ 4 กันยายน 2561 เวลา 11:21 น.